This entry was posted in Pixel Scroll and tagged Amal El-Mohtar, Chip Hitchcock, David Brin, Diana Pavlac Glyer, Doctor Who, Dr. Michael Ward, Game of Thrones, Ghostbusters, Guillermo del Toro, Harry Potter, Irene Gallo, James A. Owen, John Carpenter, Kelly Sue DeConnick, MidAmeriCon II, Society of Illustrators, Steven Harper Piziks, Wiscon by Mike Glyer. Bookmark the permalink. (9) BIRTHDAY MUPPET. I’m confused; Oscar dates back to November 10, 1969, Wikipedia sez. Even if that’s wrong, I know I saw him many, many years ago as a kid, so he can’t have been born June 1, 2000. (12) ONLINE PAYMENT OPENS. Oh, bleah, I have to get around to this before I forget. Not now, but soon, I promise! Lise Eisenberg: Well, you certainly have a point. Oscar the Grouch originated on the air in 1969. The Sesame Workshop acquired the marketing rights to the character in December 2000. There are almanac websites that have assigned Oscar the birthyear of 2000, but they don’t give a source. I don’t suppose it would matter if they did…. @alexvdl: Cool re. Myke Cole, thanks for mentioning it. And wow, that’s quite the beard he’s sporting these days. @Paul Weimer: Hey, congrats on the B&N Sci Fi blog gig! @Music in Books People: Sean Williams wrote the “Astropolis” series with a character who only spoke in lyrics from Gary Numan songs (whoever Gary Numan is). I think chapter titles were also based on Numan lyrics or song titles. It was a weird series (even apart from the character, Render). @JJ: LOL, oh yes, love that quote and movie. NEED A CATCHY DESCRIPTION HERE. I know these have to be finalized in a last-minute time crunch, so I’m perfectly willing to cut them some slack. Hey, despite my best efforts, the preview box is showing the formatting here to be very screwy. So I’m not throwing stones; I’m just being amused. The urban fantasy/mythic fiction popularized by Charles de Lint and Terri Windling often contained music, with musicians as either central or peripheral characters. Usually, but not always, folk/acoustic musicians. But de Lint’s novels, Windling’s Bordertown shared world anthologies, and Charles Vess’s graphic novel The Book of Ballads are there for people who like this kind of thing. There was also an excellent anthology, The Horns of Elfland, edited by Ellen Kushner, Delia Sherman, and Donald G. Keller, from Roc in 1997, long out of print but pretty available used. Windling’s story in here. “The Color of Angels,” is one of my all-time favorite stories, and there are a bunch of other good ones, too. Posted review of The Masked City by Genevieve Cogman a couple days ago. Don’t think I mentioned that before, though I might have. Things have been a little disrupted here. 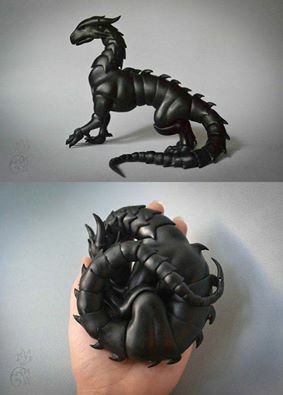 Would love a posable dragon. Not going to happen, alas. The urban fantasy/mythic fiction popularized by Charles de Lint and Terri Windling often contained music, with musicians as either central or peripheral characters. Re: urban fantasy and musicians, don’t forget Emma Bull’s War for the Oaks. That was–1987, I believe? I read War for the Oaks last year and really enjoyed it. Fun fact about War for the Oaks: Prince was one of the inspirations for the Phouka character. “In Dreams”, an anthology edited by Paul J. McAuley and Kim Newman, had some excellent rock&roll themed SF stories including “Dori Bangs” and “Snodgrass”. War for the Oaks was 1987; I just read it for the first time this week and really enjoyed it. Brust’s The Gypsy featured the tambourine, and folk-punk band Boiled in Lead wrote an album featuring lyrics from the book (“Songs from The Gypsy”). Elizabeth Hand’s Wylding Hall features a band that seems similar to the British folk-rock bands of the late ’60s and early 70s (Steeleye Span, Fairport Convention). A 70s novel named Time of the Hawklords began an incomplete trilogy about the SF-ish adventures of Hawkwind as cosmic heroes. Michael Butterworth wrote the book while Michael Moorcock did the plotting, but the publisher broke an agreement and put Moorcock’s name over Butterfield’s name. I’m glad to see that people are still discovering and enjoying War for the Oaks. I worry that the music references in it might be getting a bit dated, but I guess it still holds up fairly well overall? Speaking of Fairport Convention, more sad 2016 musician news: their original fiddler, Dave Swarbrick, just died. He’d been in poor health for quite some time, so this wasn’t exactly unexpected, but it still makes me sad.